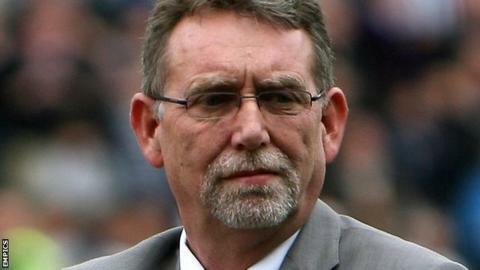 Notts County owner Ray Trew has agreed a deal to sell the club to an American company, BBC Radio Nottingham reports. Trew will also meet another potential buyer, who flies in from China on Tuesday, while local businessman Alan Hardy has made a formal written offer to buy the League Two club. Hardy is the chief executive of the Paragon Group, and owns the Nottinghamshire Golf and Country Club. But the agreement with the US company appears to have scuppered his chances. Trew announced last month that he was looking to sell the League Two club after his family were subjected to "foul and mindless abuse". But he is understood to consider that Hardy's bid - which is reportedly between £8m and £10m - is way short of his valuation. Hardy had insisted any agreement includes a clause that sees Trew settle any undisclosed debts and liabilities. HM Revenue & Customs has issued a winding-up petition against the club, with the case adjourned until 25 April.